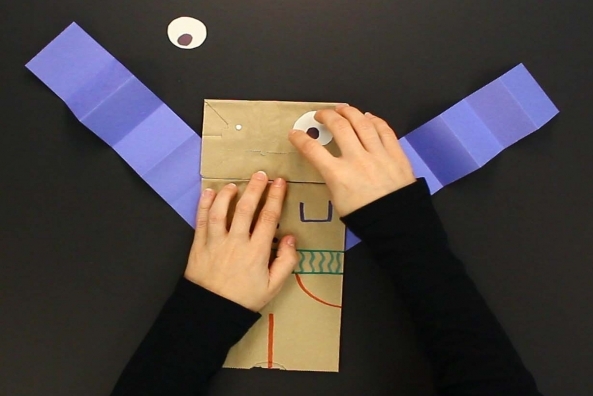 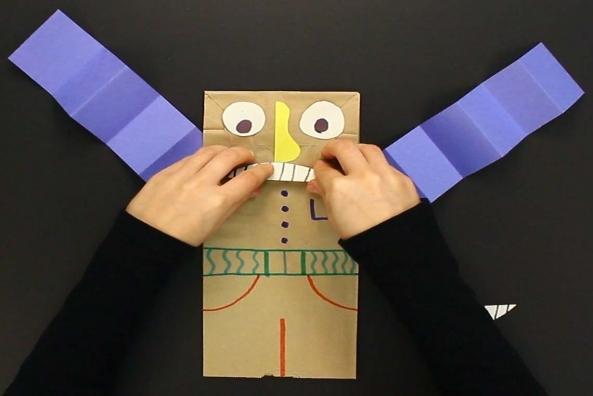 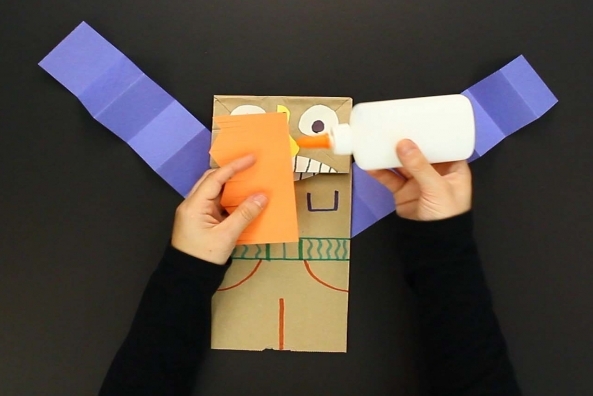 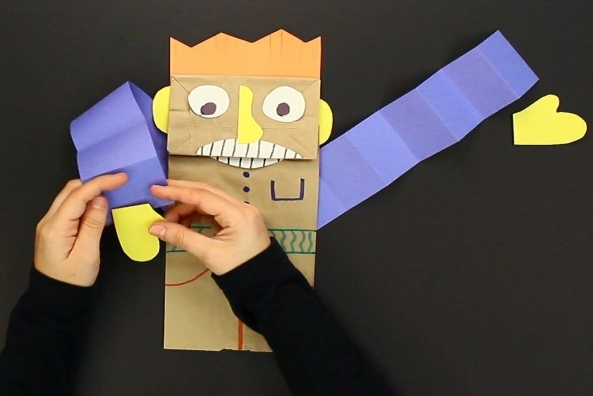 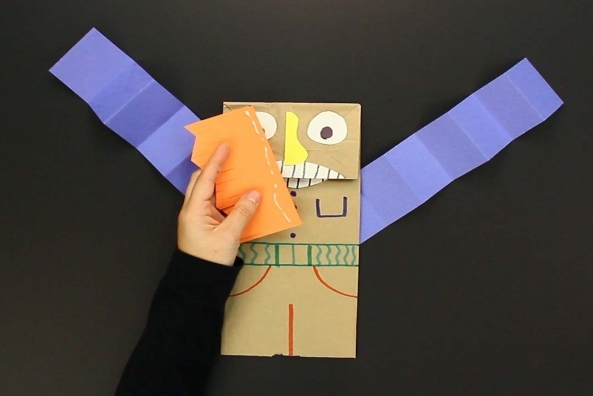 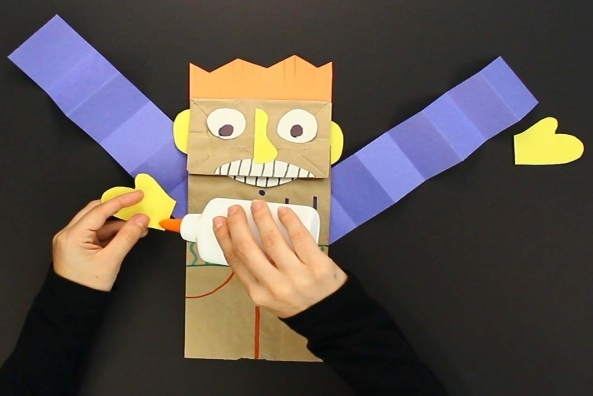 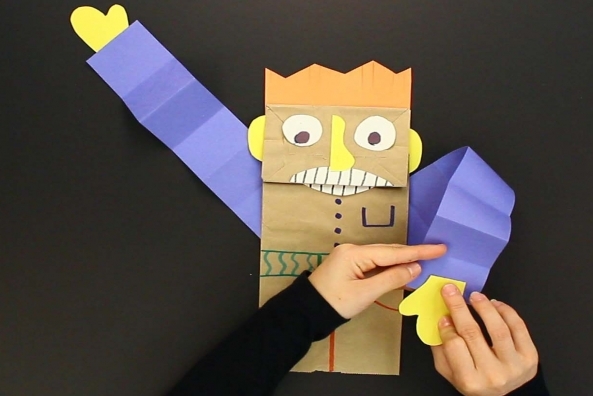 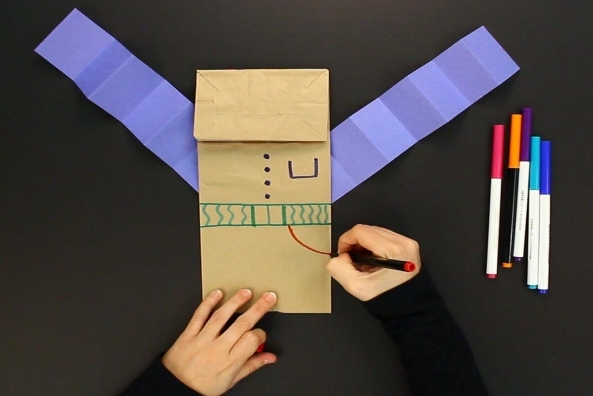 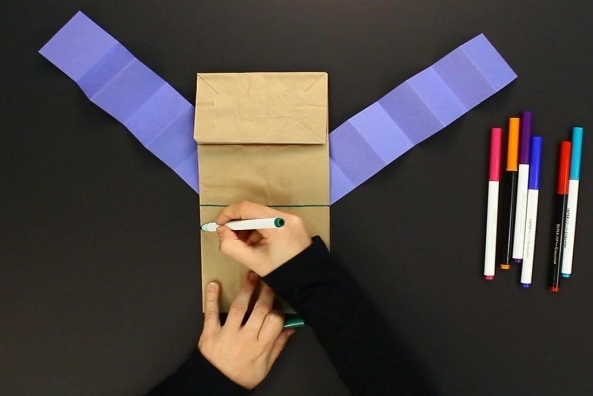 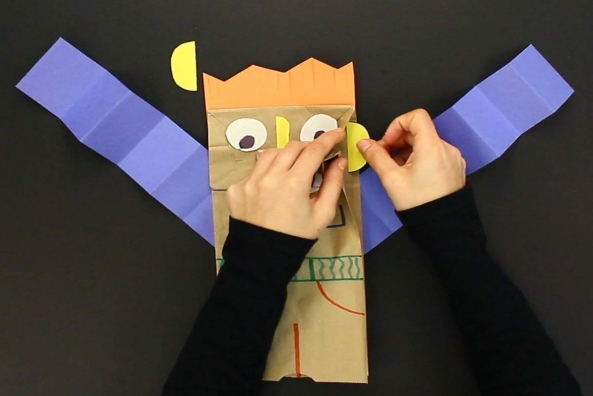 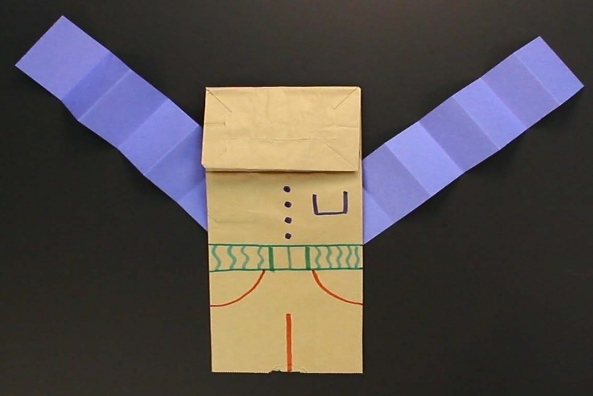 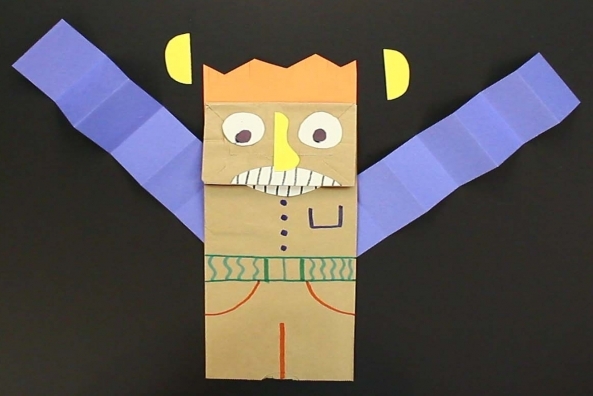 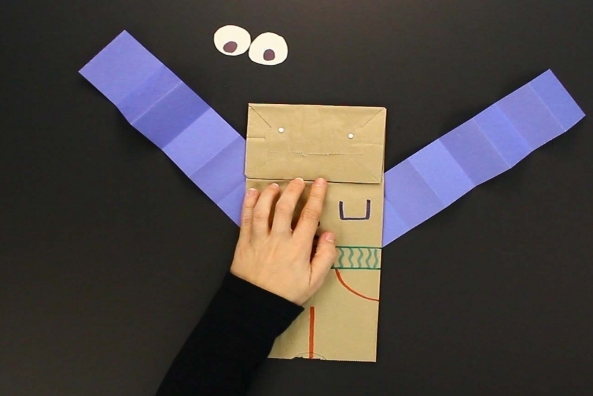 With different colored paper and a paper bag you can create an entire cast for a puppet performance. 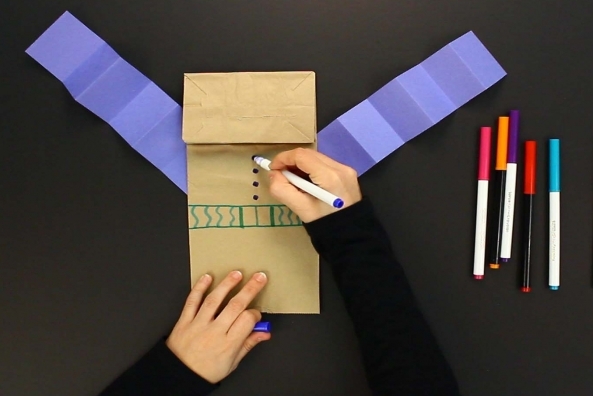 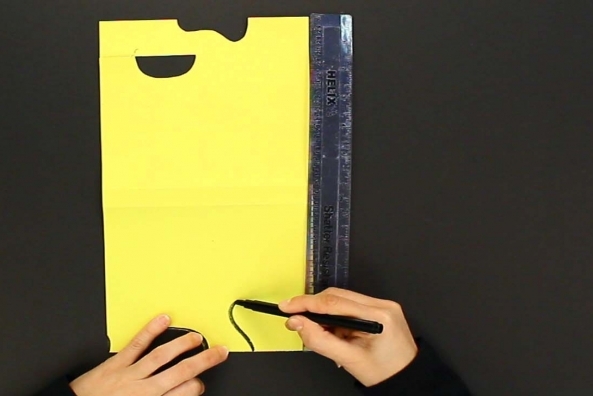 This craft helps you turn an ordinary paper bag into a bag of fun! 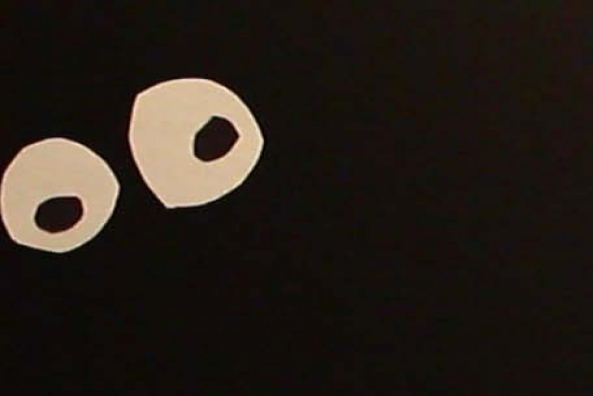 Join the famous Muppets in this adventure. 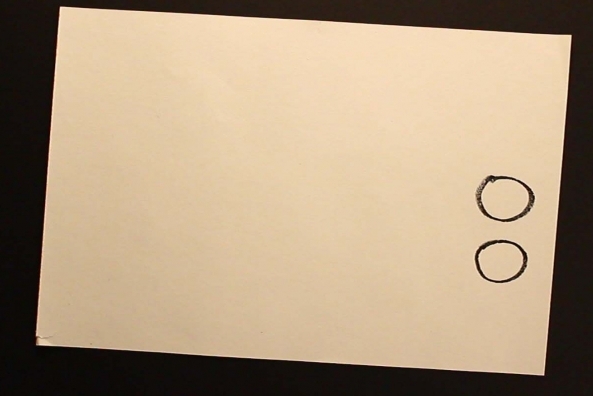 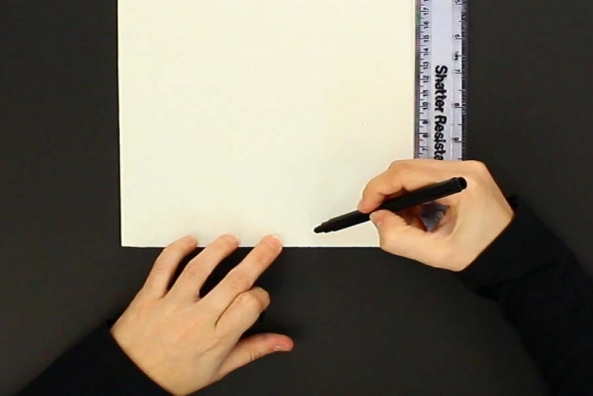 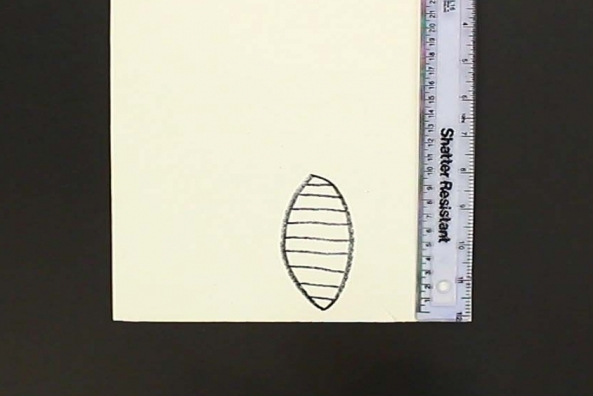 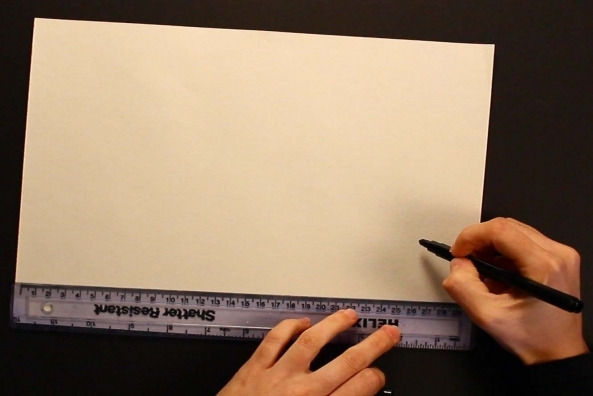 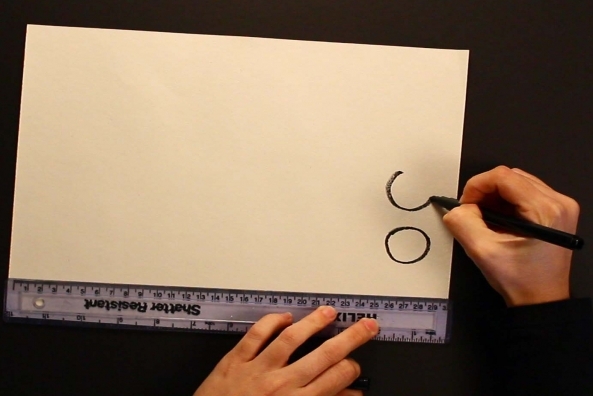 Draw two circles on a piece of white construction paper. 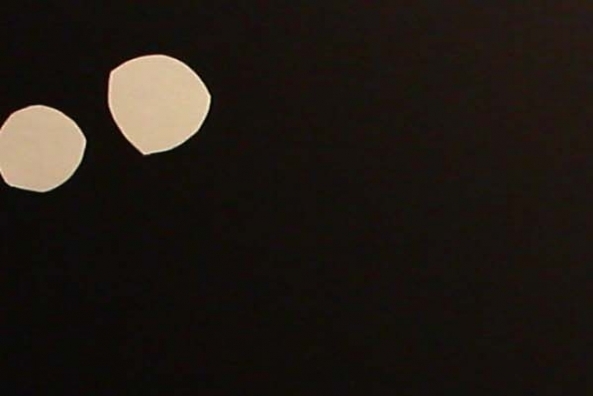 Cut two circles out of a piece of white construction paper. 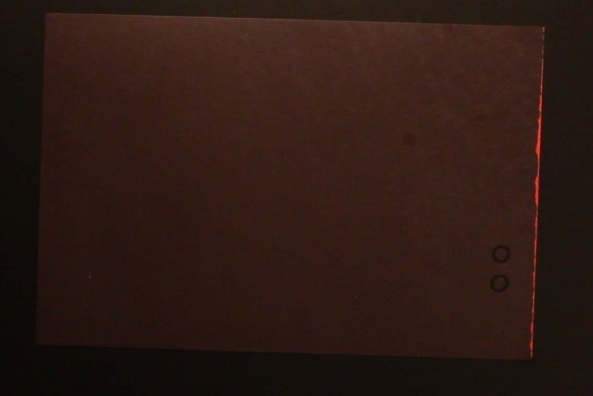 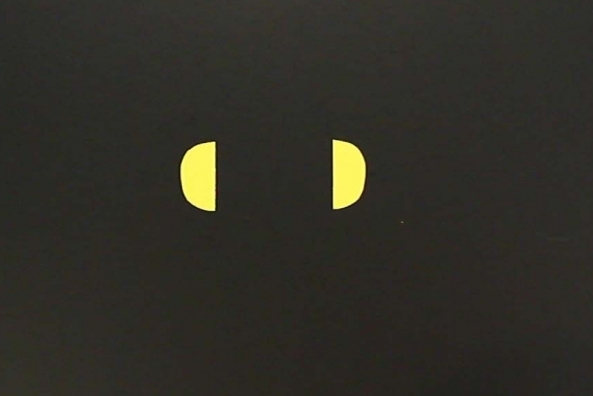 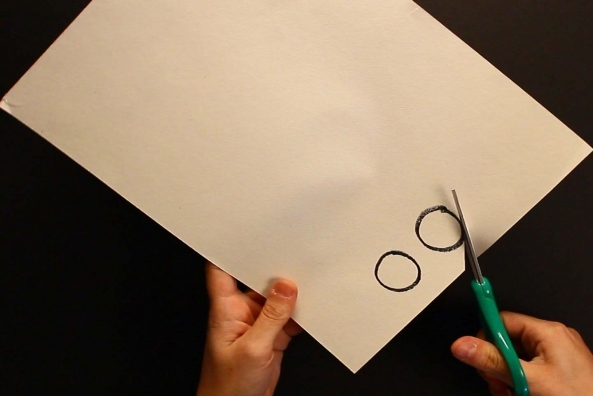 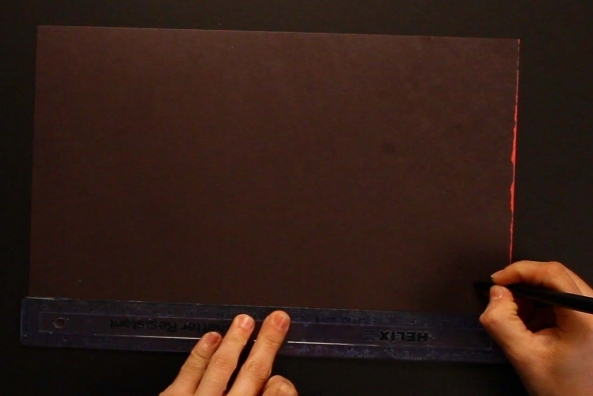 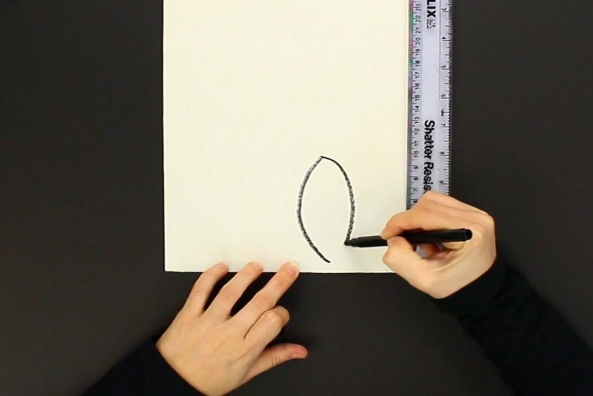 Draw two smaller circles on a piece of black construction paper. 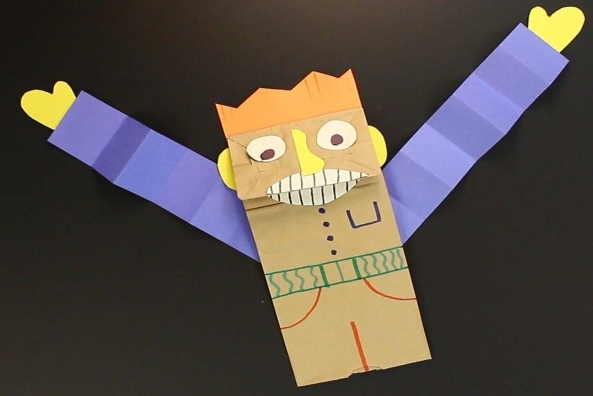 Tip: Use different colored construction paper to make different colored eyes, such as blue, green or brown! 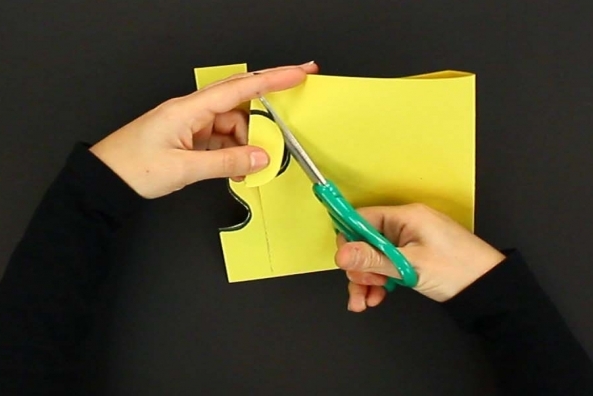 Cut out two smaller circles. 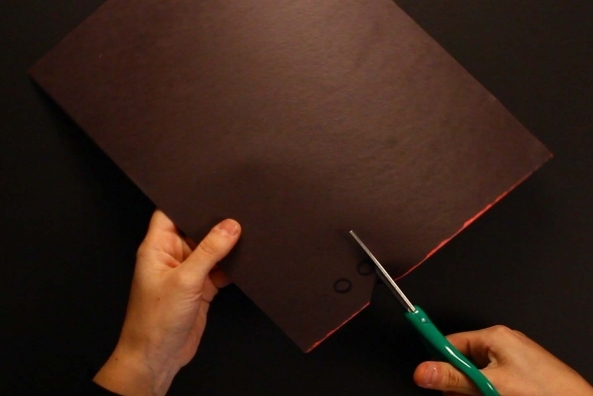 Cut two smaller circles out of black construction paper. 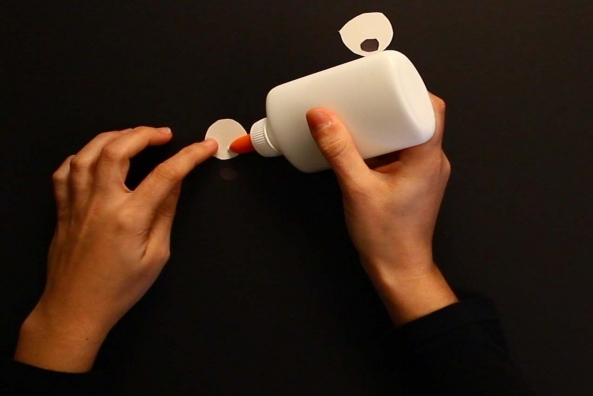 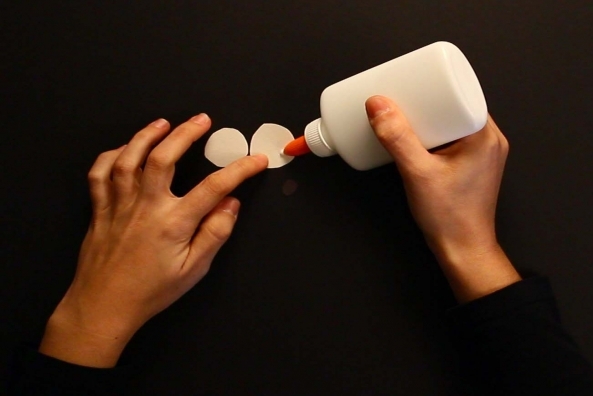 Glue the smaller circles onto the white circles to make eyes. 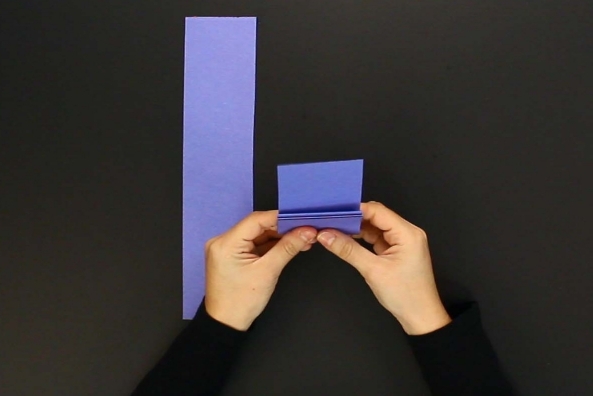 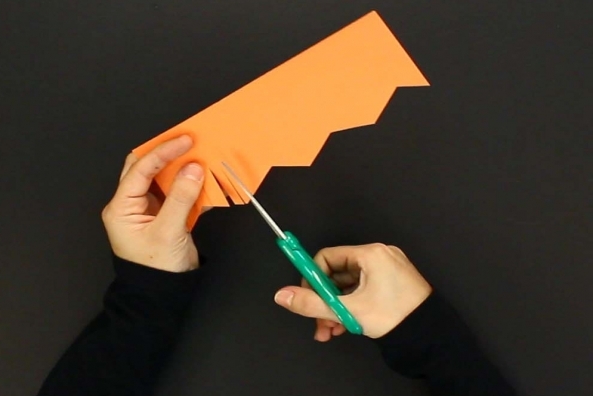 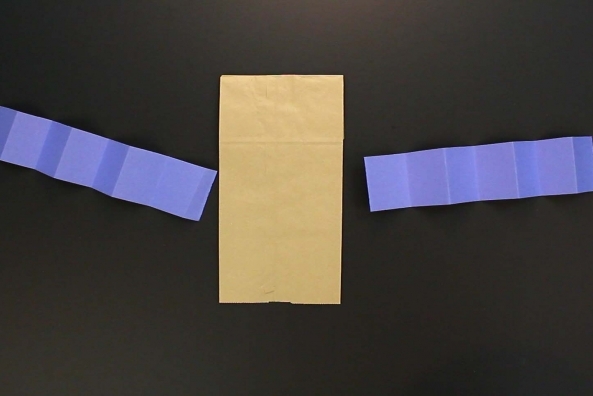 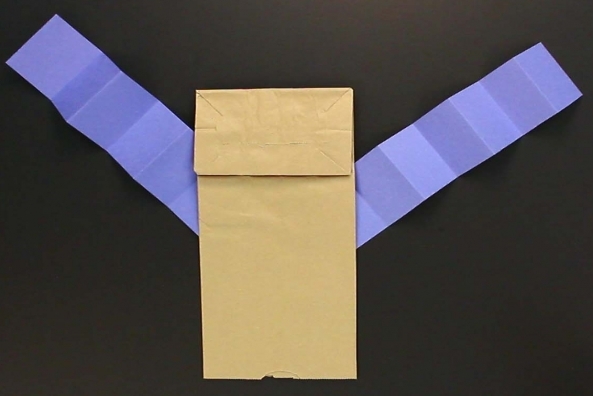 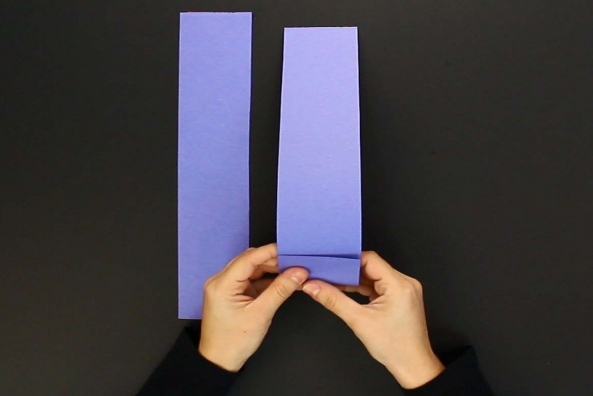 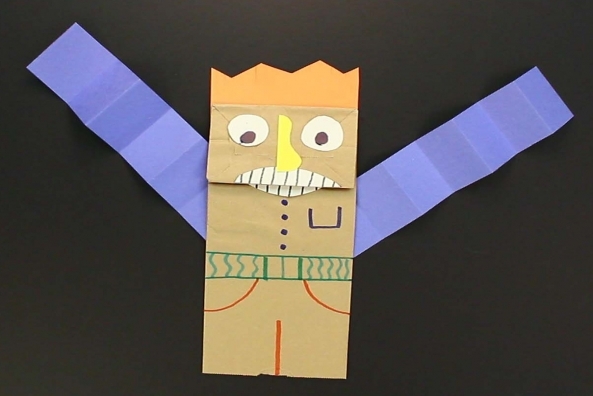 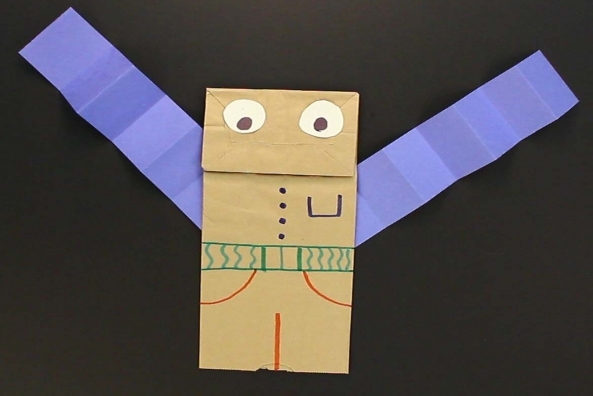 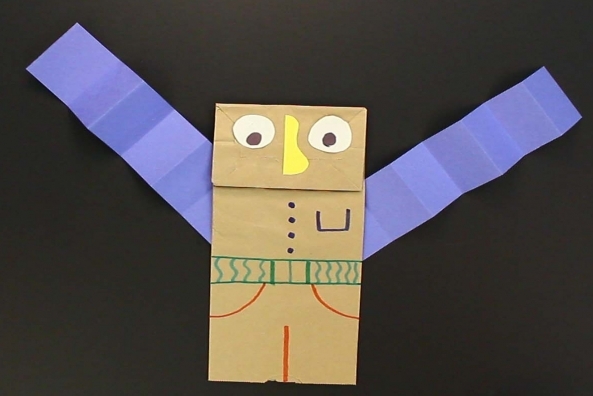 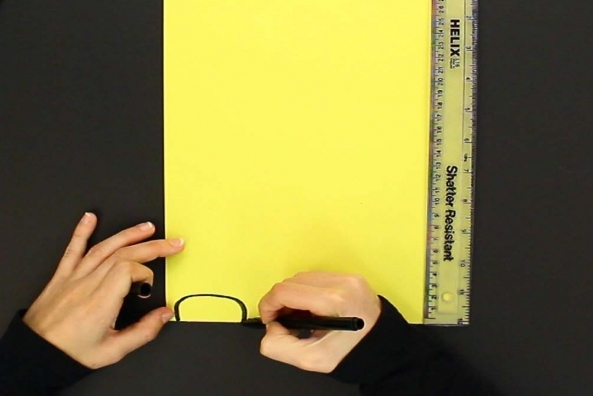 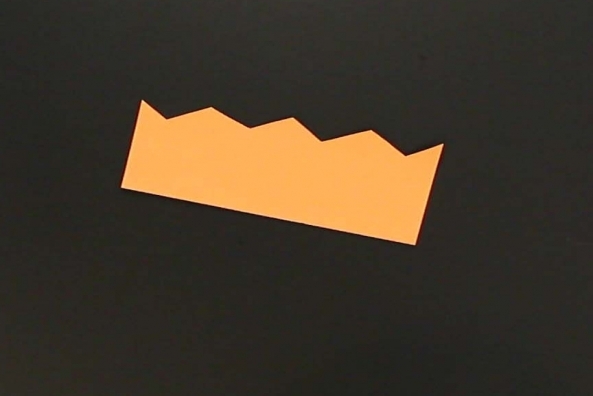 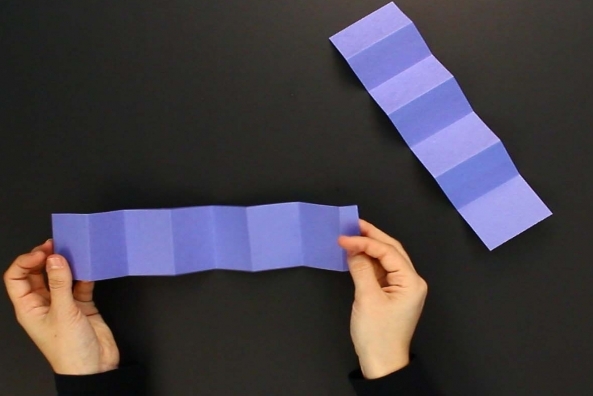 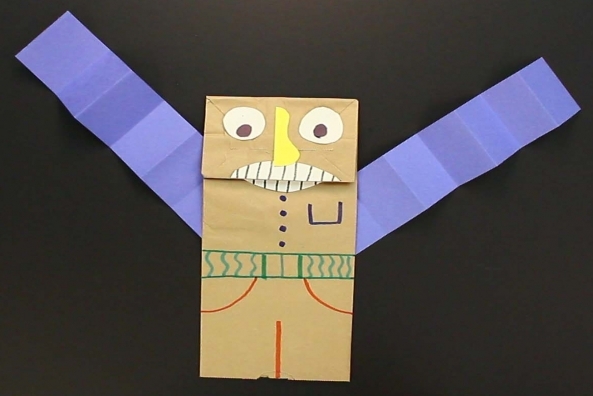 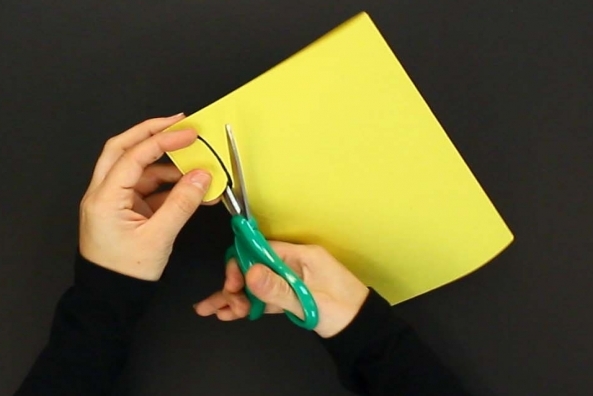 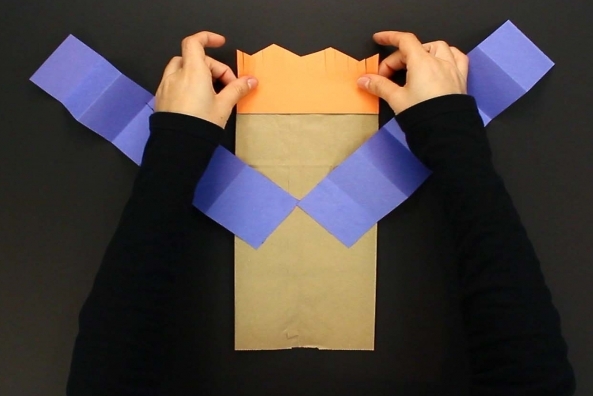 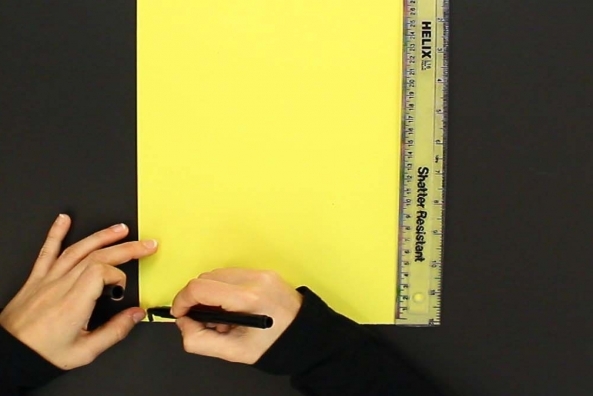 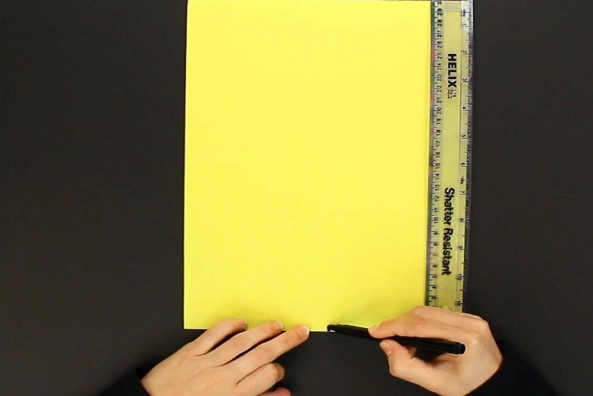 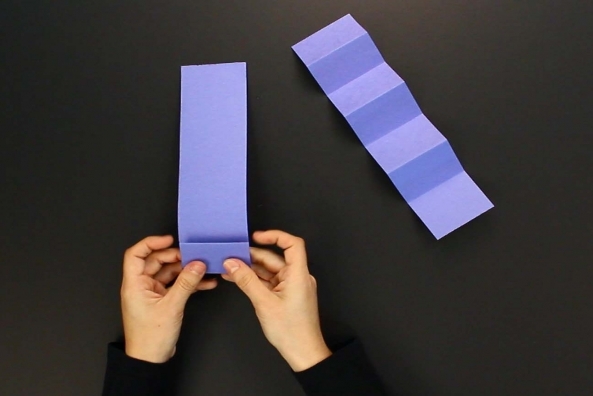 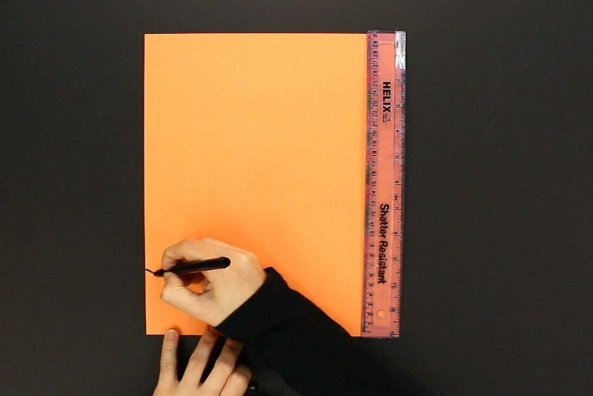 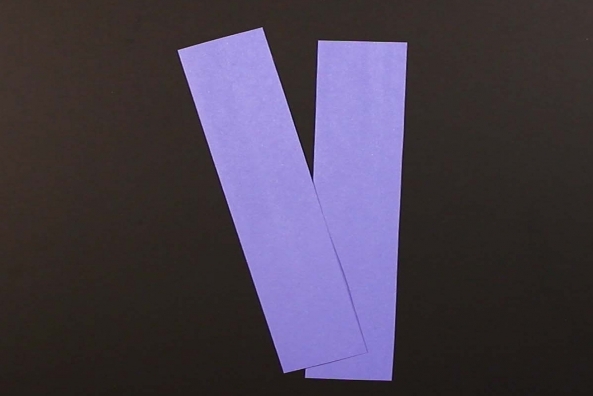 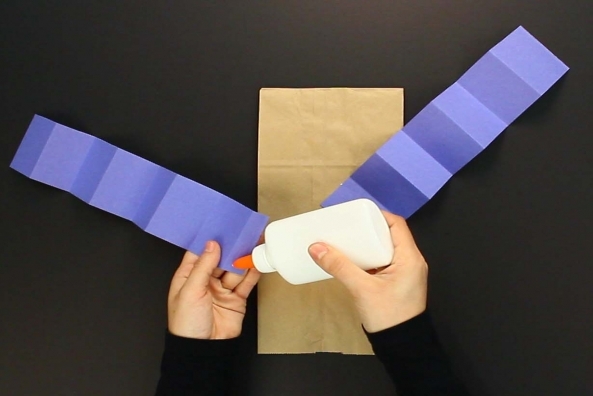 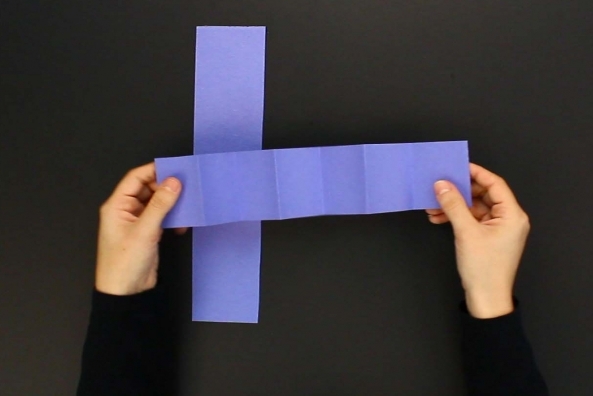 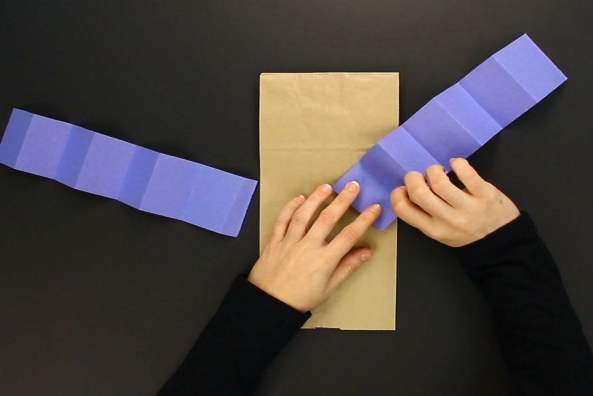 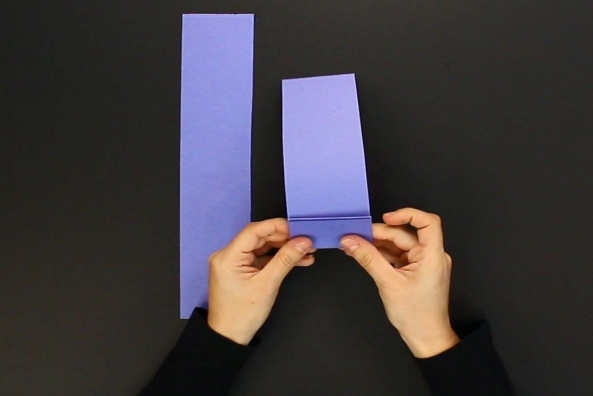 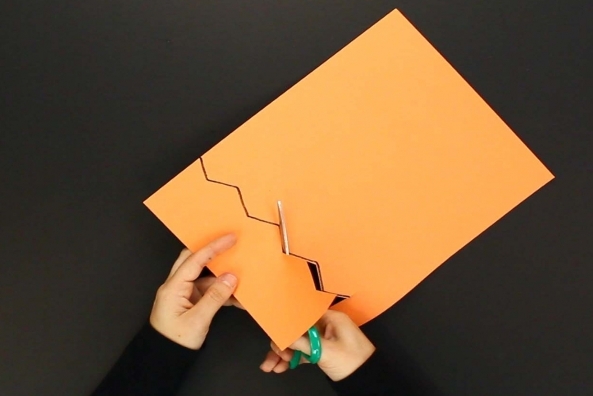 Cut two rectangles out of a piece of construction paper of any color for arms. 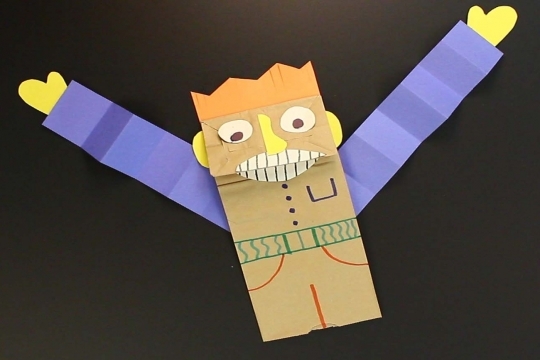 Fold the arms back and forth, like an accordion. 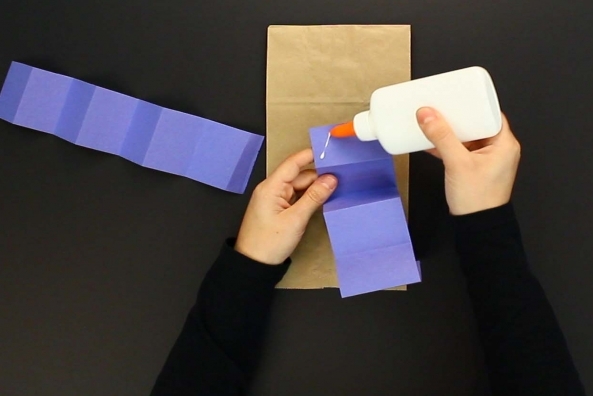 Glue the arms on the back of the paper bag in any position you want. 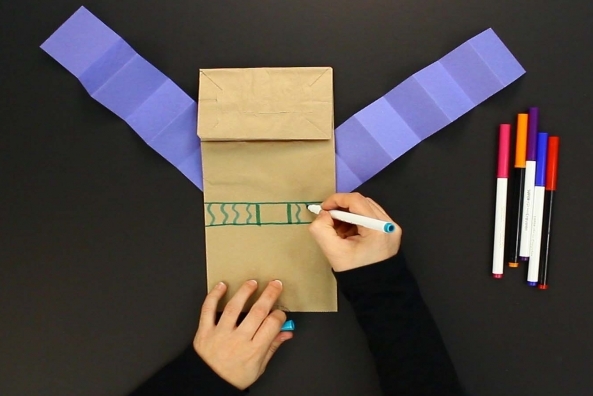 Draw clothing on your paper bag with markers or crayons. 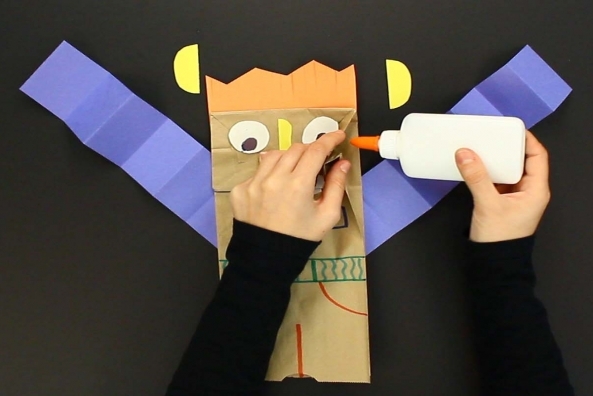 Glue your eyes onto the top of your paper bag. 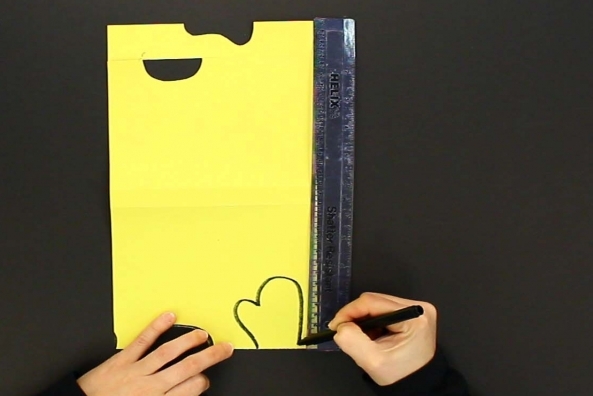 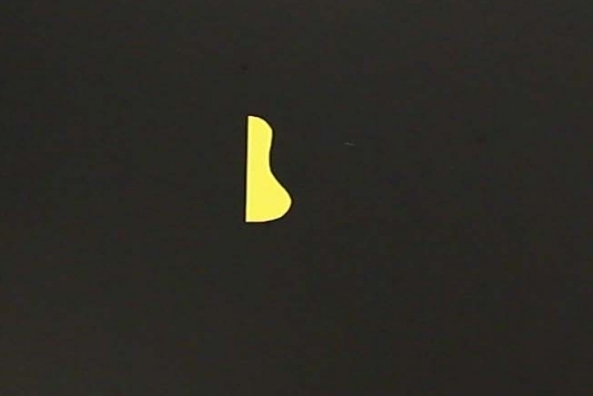 Draw a nose on a piece of construction paper. 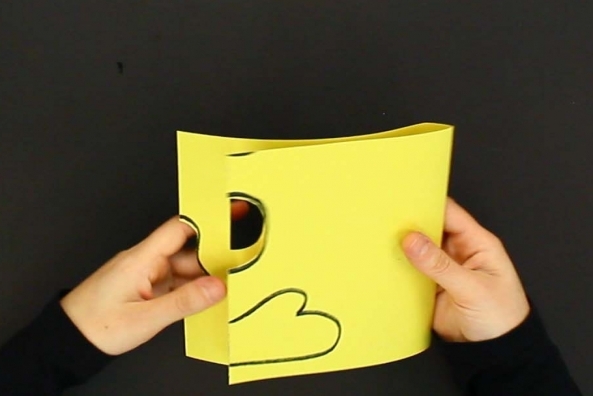 Cut out a nose from a piece of construction paper. 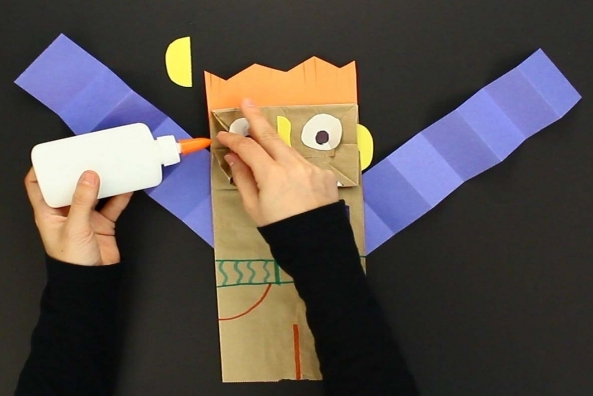 Glue the nose between the eyes. 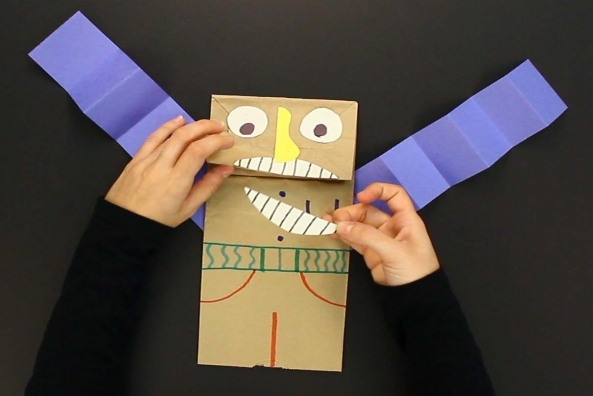 Draw a mouth on a piece of construction paper. 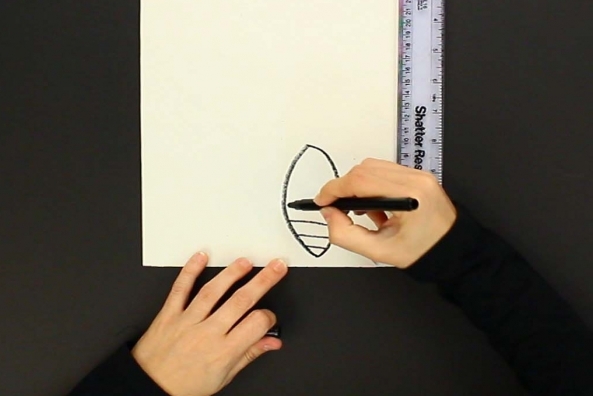 Tip: Draw a football shape for a perfect mouth. 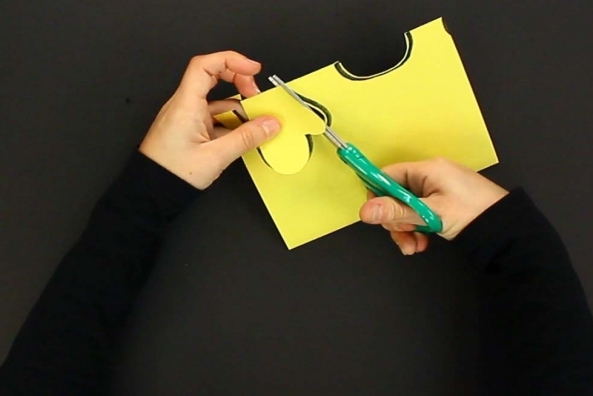 Cut the mouth in half. 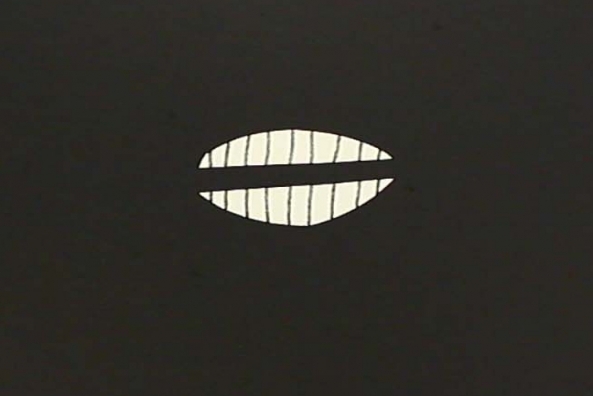 Cut the mouth in half so you have a top lip and a bottom lip. 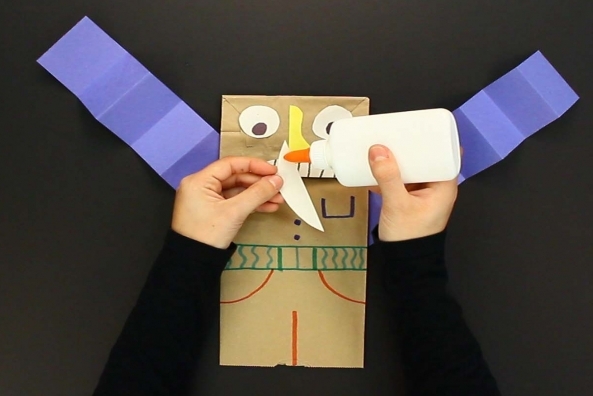 Glue the top lip under the nose. 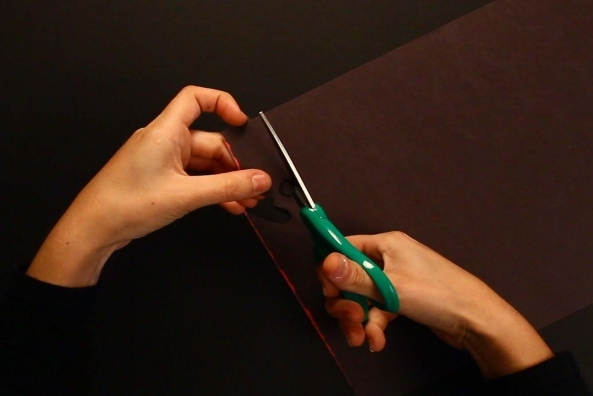 Glue the bottom lip under the fold of the paper bag. 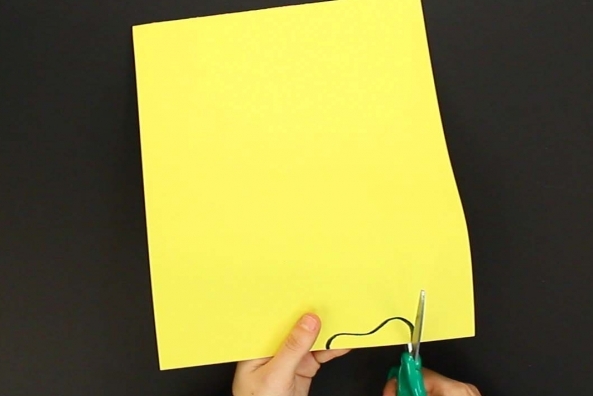 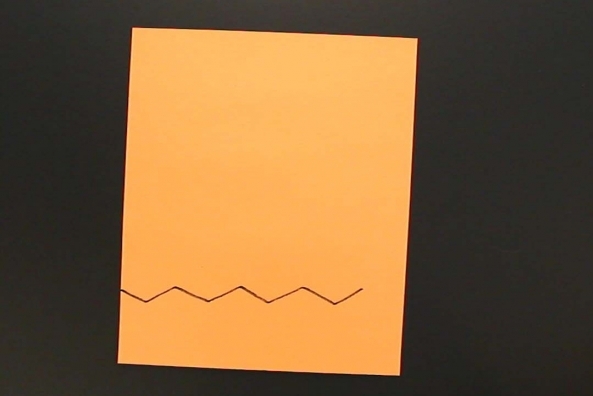 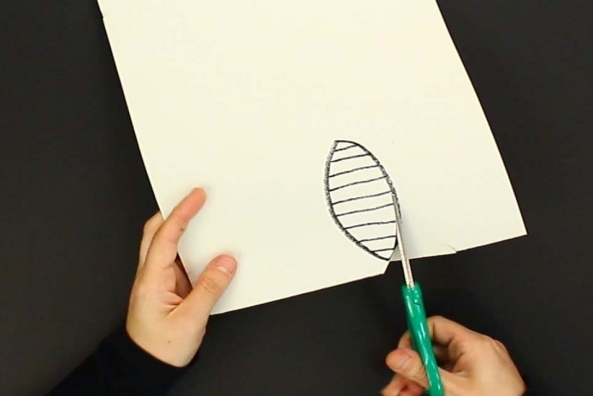 Draw hair on a piece of construction paper and cut it out. 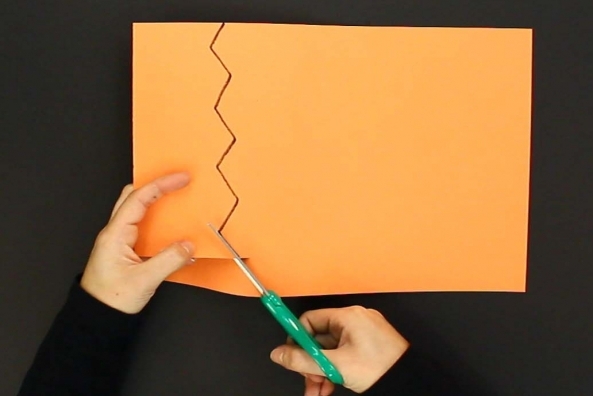 Tip: Cut slits halfway down all the way across the rectangle to create spiky hair. 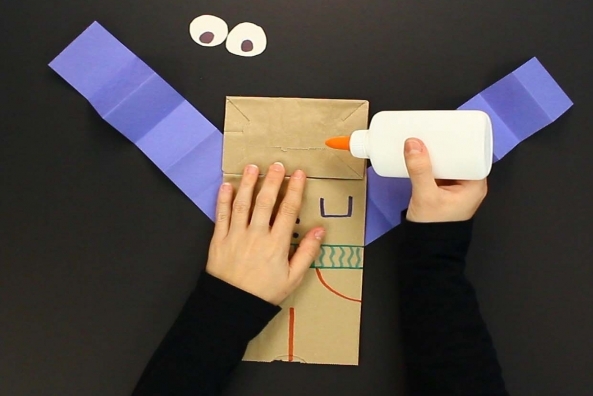 Glue the hair on the top of the head. 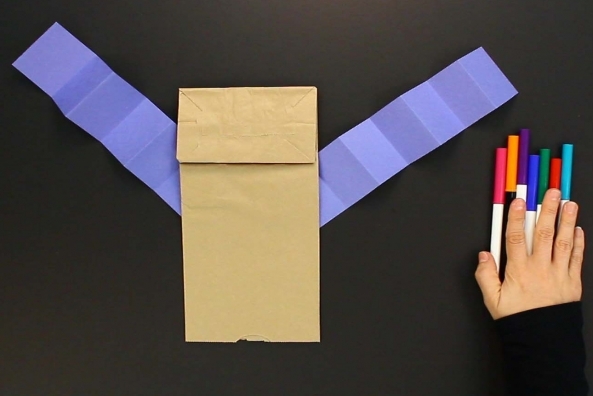 Draw two ears on a piece of construction paper. 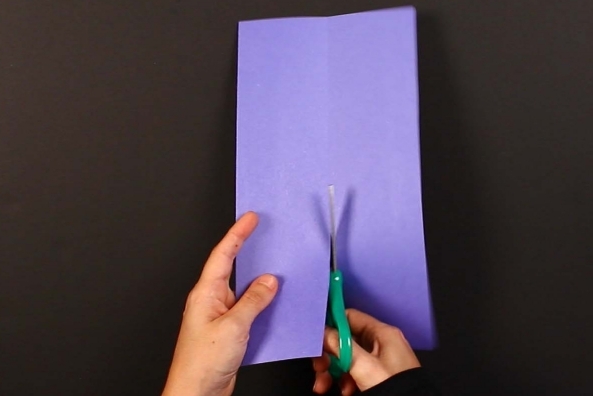 Tip: Fold the paper in half and cut out two ears at once! 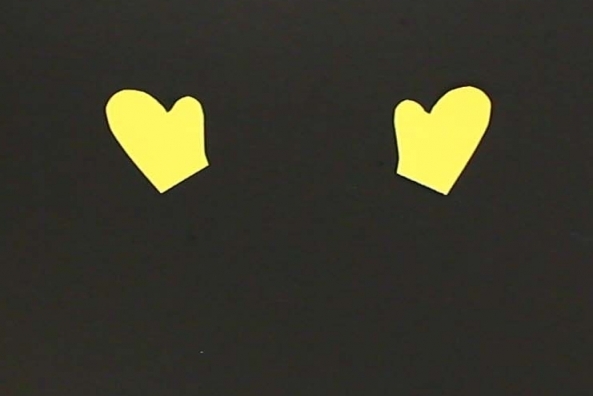 Cut out two ears from your construction paper. 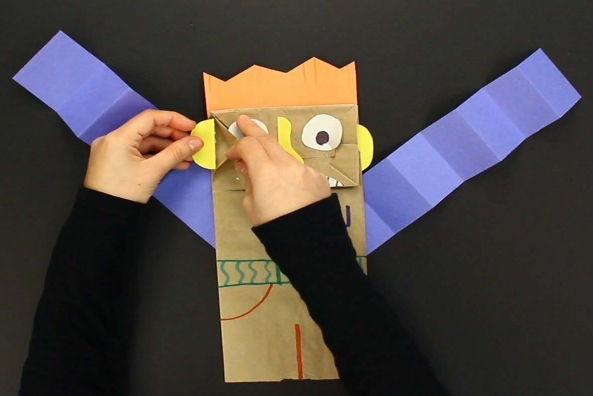 Glue the ears on either side of the face. 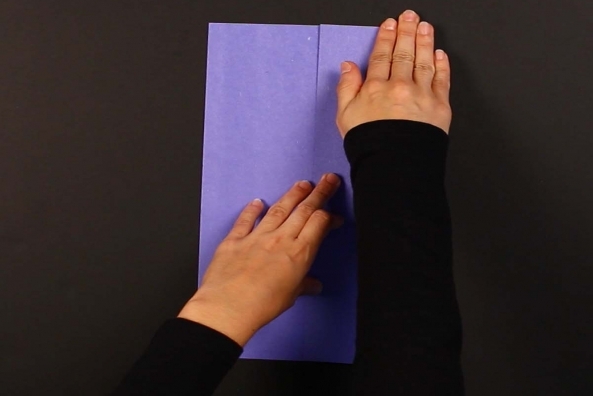 Draw two hands on a piece of construction paper. 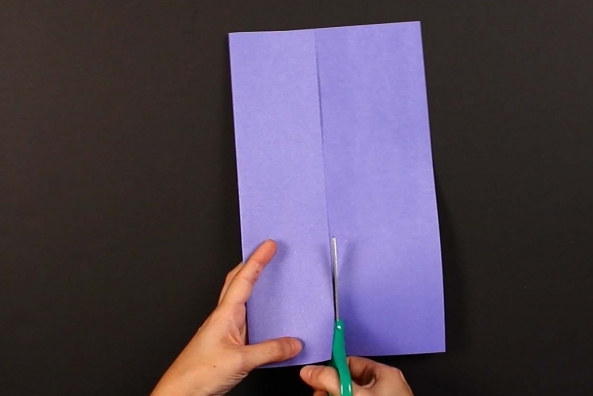 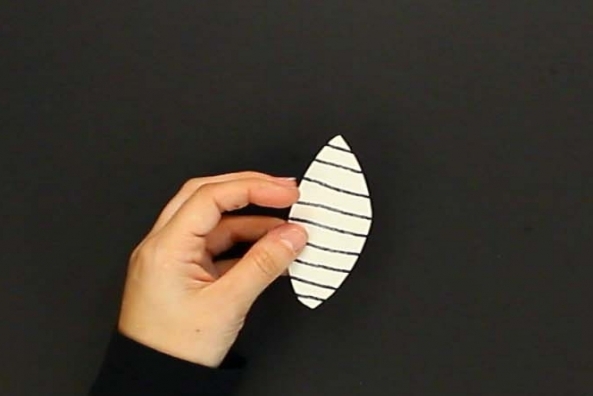 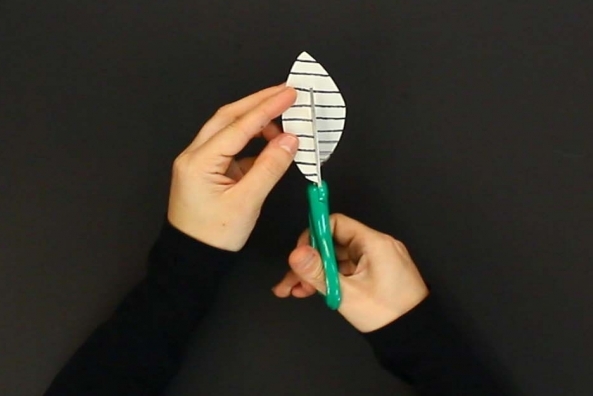 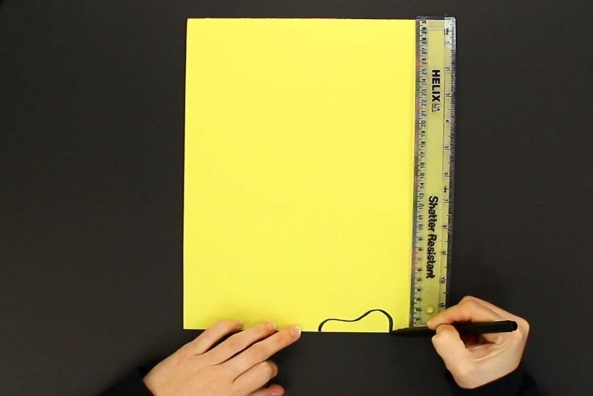 Tip: Fold the paper in half and cut out two hands at once! 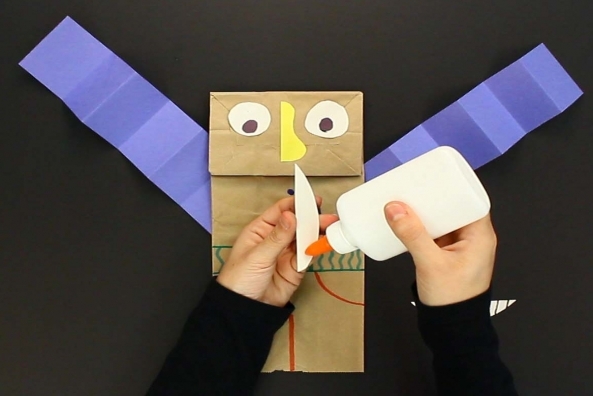 Glue the hands to the ends of your arms. 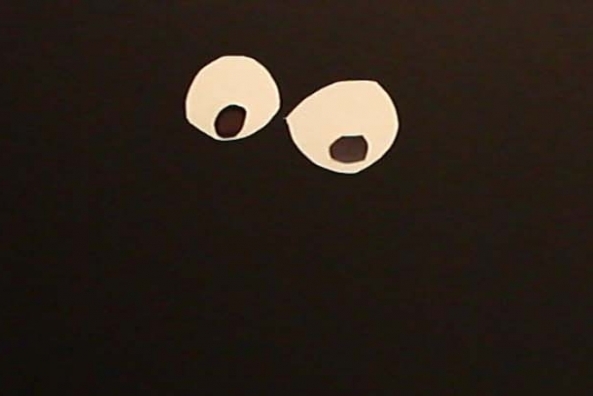 Make up a background story for your character, or a special voice!